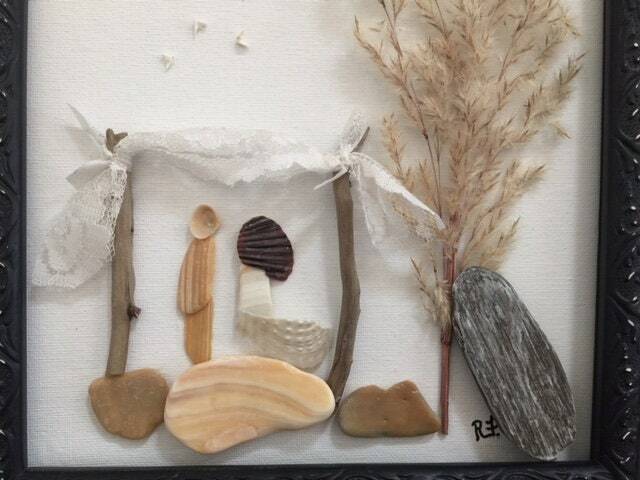 This exclusive Beach House Dreams design, a mixed media art piece featuring shells, driftwood, pebbles and even shell "birds" makes a perfect gift for weddings, engagements or anniversaries too. 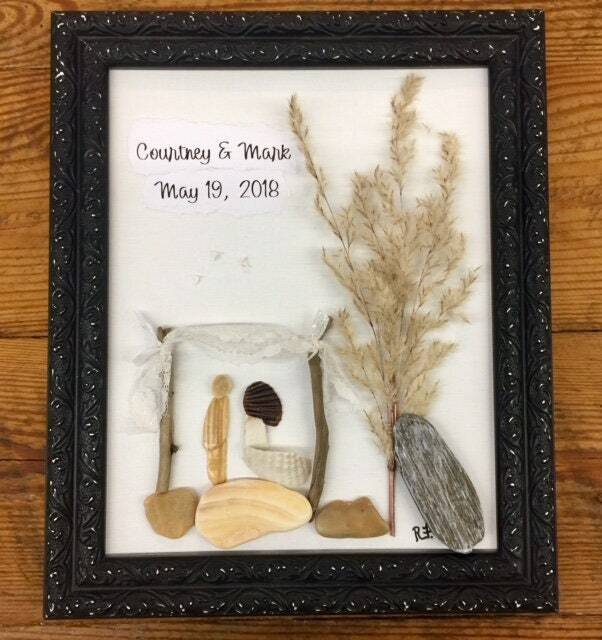 You are ordering a custom mixed media gift like the one shown, in the same style as shown but because of the unique seashells, driftwood and pebbles I personally find on the beaches of the Outer Banks, each piece will be slightly different. I can customized the design further by printing the couples first and last names at the top instead of "I have found the one..." or I can put their wedding date, at the bottom right corner, in the same font used as shown. The font is professionally printed on premium cardstock, and then I tear the edges and attach it to the background. 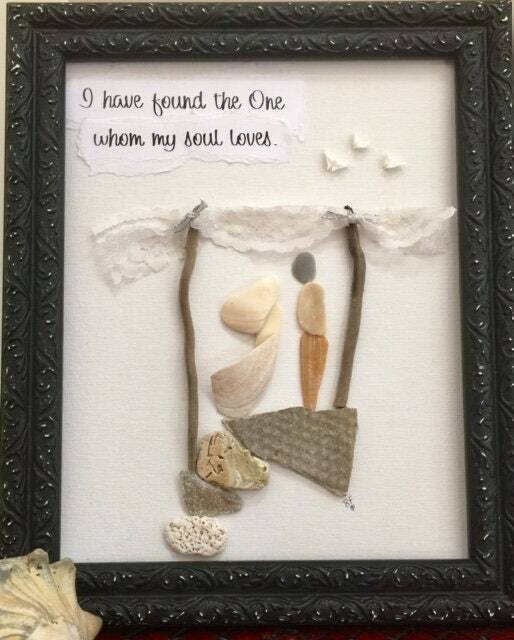 Your custom art will be a male and female made of shells, on a ledge with several pebbles or shells. There will be a gazebo with vintage lace on the top, as shown as well. 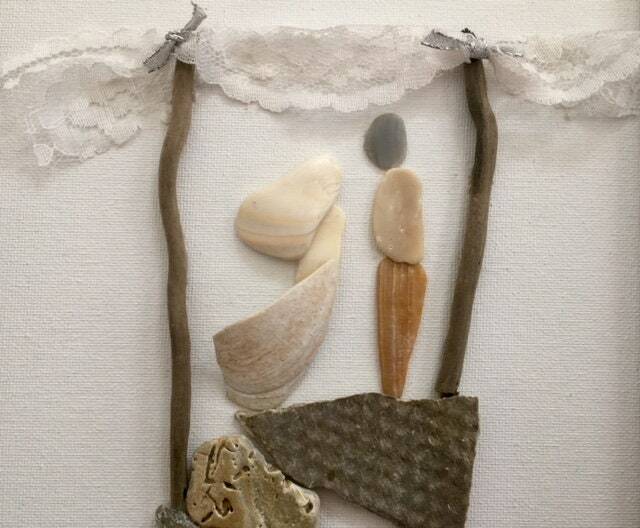 The 3 birds also come off of our beaches here-the vintage lace is the only item used not found on the beach here by me. Your art will be shipped using priority mail, arriving within 3 business days after I ship. 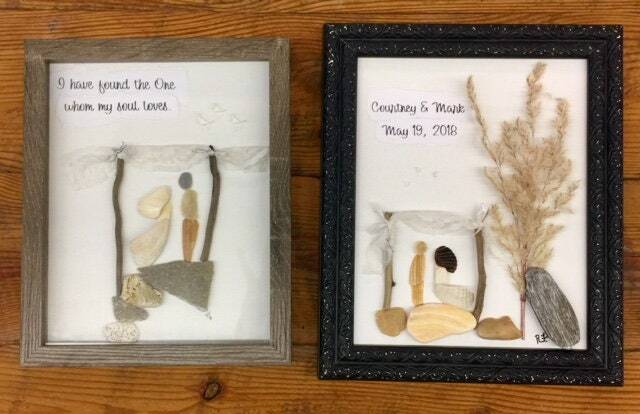 I complete custom orders in the order in which they are purchased. So, please remember to allow at least 7-10 business days, from the time I receive your information, for making your custom mixed media art. I am sorry we cannot accommodate any rush orders at this time, so make sure to purchase at least 3 weeks before you need it. 1. 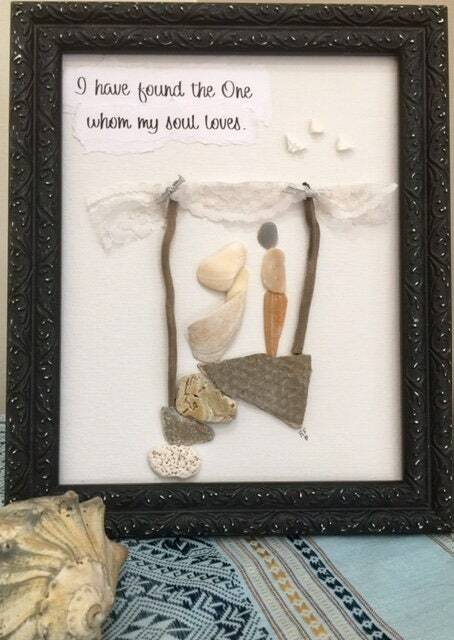 Do you want the phrase shown (I have found the one whom my soul loves) or couples name and wedding date? 2. If not "I have found...", what short phrase do you want at the top to the left (like 2 first names, Rita and Tommy?) etc. I will contact you if you select a phrase that is too long to fit at the top so you can choose shorter lettering. 3. Do you want a date (8 characters, like 12.29.84) added on the second line of the text as shown? 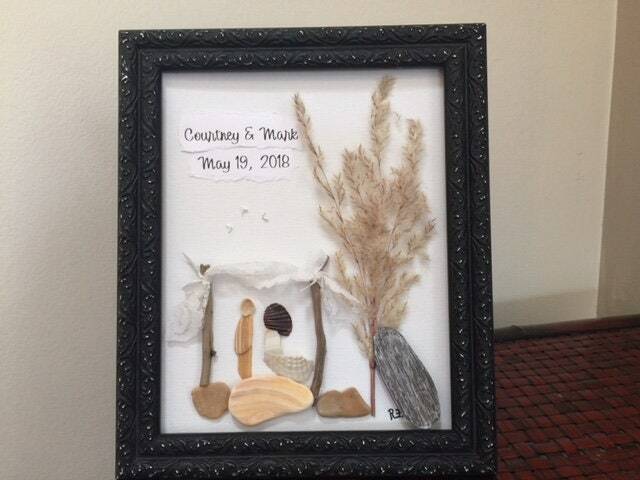 This listing is for the ONE framed design in the gray shadow box style as shown ONLY on the left in the first photo. (The black frame is not available) The canvas board used is of premium artist quality in a standard 8 x 10 size. The adhesive used is permanent. 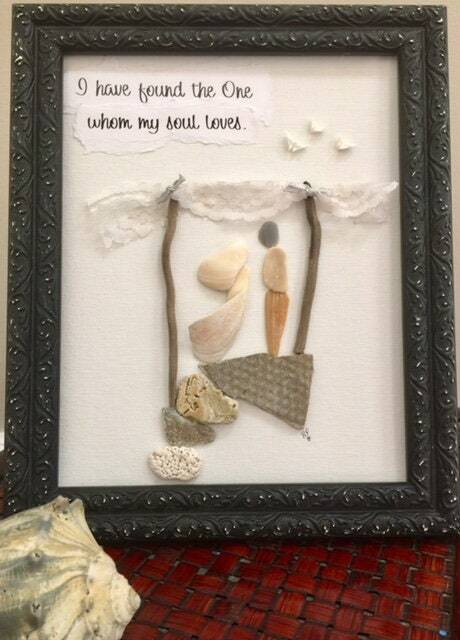 NOTE: This is an exclusive BeachHouseDreamsHome design (including all of my 5 x 7 and 8 x 10 prints, mixed media art pieces, including our LOVE prints, the heart shaped word designs, "dad" "mom" and "sister" or "friend" designs. You may not copy or reproduce this design without my permission. Please respect my original designs.